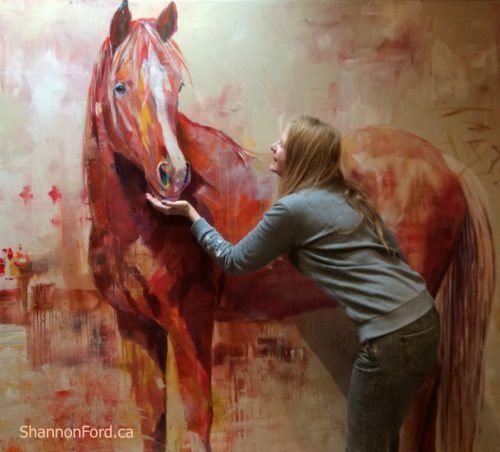 Shannon Ford is considered by many to be one of Canada’s top Contemporary Animal and Equine Artists. Shannon Ford truly has her own distinctive manner and style. Her success as an award winning jeweler and sculptor for over 30 years has greatly influenced her works on canvas.The subtle impact that painting with her own handmade gemstone powders, and incorporating cut gemstones, 24 Karat Gold and Palladium has on her work – has made Shannon one of “the most talked about artists – among artists” to come along in years! Selecting the finest precious and semi-precious minerals available for her work is fast becoming one of Shannon’s best-known secrets. I am a Canadian Artist Represented by Art Galleries Across Canada, I hope that I can help you to find the painting that you will Love to Live with. I fell in love with your work when I first saw it at Jasper Park Lodge a couple of years ago. I’m wondering if there will ever be a time when prints of Young Grizzly will be available to purchase? Hi Sherri, Thank you for writing and for your interest in my artwork! How wonderful to hear from you!! There has been no plan so far to make a print series of Young Grizzly, however I am forwarding your email to Mountain Galleries, who will be happy to contact you and keep you up to date on upcoming prints. It is very touching to know that you have remembered Young Grizzly so well from a couple of years ago. Some paintings stay with us that way, it is a very special thing. Would Wolf Way be available or have you already sold the original painting? Pricing? Very much enjoyed seeing your art as we regularly visit the Mountain Gallery; although we’re usually more interested in your horse paintings. Wolf Way is an amazing painting, thank you for noticing it. I believe it is available, but may I ask Mountain Galleries to contact you to confirm and to provide details? How great that you are enjoying my horse paintings, too! In case you are interested, I do have a few horse paintings coming to the show too. Will you be coming to Whistler the week of my show? I am so excited to be Artist in Residence for a few days after the Opening, I will be painting live in the Fairmont. my husband and I had the privilege of viewing your works in pincher creek . My husband would have bought Unspoken Understanding on the spot! It totally captures his relationship with his Andalusian stallion . We are close to Lethbridge and I was told you have a studio there . We would be thrilled if you could find the time to meet Gurka. He is one of a kind and might be a candidate for a painting . Your use of colour to capture the spirit of the horse is remarkable. All the best . Met you at the opening in Penticton. Hoping to get a little more info about you and your work for my in process article about your show? We go to press later this week, so timing is tight. It was so bvery nice to meet you and to see your work first hand… and to meet one of the beautiful subjects of your work. I am looking at your work for my Arts Education class. I have a few questions for you! I was wondering if you used any other artists as inspiration? Have you were supported a charity with the profits from your painting sales? What is your favourite piece that you have created and why? What is it like to be a Canadian Artist? Are any prints of your bears going to be available soon? I would love one but unfortunately cannot get an original. Thank you for writing, and for your interest in collecting my artwork! I was in Banff in December and saw your Grizzly in Pipestone #5 in the lobby of the Fairmont. I was so happy to see print #2 of the same painting in Mountain Galleries and promptly purchased it and had it shipped to Atlanta, Georgia. I absolutely love it. Last week I received the notice about your upcoming exhibit in Whistler. I was excited to see that you included polar bears in your wildlife collection and purchased pre-sale Polar Sky. I can’t wait to get it after the exhibit and am so excited to own one of your originals. You’re work is absolutely amazing. I just wanted you to know you have a fan for life in Georgia!! Hi:) I’m interpreting your art in a piece for my art class. I was wondering how you picked your colours for your different paintings and what kind of things you want people to feel when they look at your art? Nice to hear from you! I studied Colour Theory in Art College so I do have formal training in colour. I remember how demanding it was to learn to accurately mix colours, understanding the theory, the endless squares of colours, colours in colours etc.. However.. at some point my own voice as an artist became strong and I developed confidence in my own unique sense of colour. Even now, It is a mystery to me how things happen with a painting. Every little colour chord affects the harmony of everything else in a painting … As I don’t plan out my paintings, every painting is a great adventure. While I paint I am in more of a “waking meditation” where my painting decisions are not thought out or planned. The cool thing is that even though I don’t think through my colour choices during the painting process… When I look at a completed painting, I can identify the colour theory after the fact. I love your artwork, but your peices are a little beyond my present budget. Do you have prints available? Thanks again for writing! I hope you have fun looking through the website! Hello, I am the guy at Calgary Stampede and thank you so much for taking your time talking about your artwork and materials. Your painting is absolutely amazing. although there were bunch of great artists at the gallery, your booth was the best. I still remember the feeling when I saw one of your work “friendly filly”, I got stunned at there. I just couldn’t put it in a word to tell but I was so impressed by the colour scheme. How nice to hear from you! Yes, I remember meeting you! Thank you for checking in and for the wonderful message. I am so totally happy to know that you are still remembering Friendly Filly! I am happy to have shared it with you! Yes, the colours on it were amazing. Please feel free to check back to see my new works! Say hi to the Dolphins and Whales from me! We’re from Kamloops but winter in Casa Grande Arizona, next door to Maurice and Jeanette Girard. I’m a mid level artist and no longer sell, but give away my paintings to friends and causes. This morning, Jeanette mentioned you so we googled your art and are sure amazed with your talent. I’m an old guy now and we lived in Nanaimo for years. Paint in the style of Dan Sawatzki, etc., but, for many years of experience, we can say that you sure impress us. Keep it up Kid. What a thrill to hear from a fellow artist! Please say Hi to Maurice and Jeanette! Maybe Denis and I will be coming to AZ next year, it would be fun to meet you! How wonderful to know that you are still active creating art, I am sure everyone who you share it with is so happy! Did you ever go to Ernest Manning High School in Calgary, in 1977 or 1978? I ask because I knew a Shannon Ford then, and you have the same hair color as she did too. Shannon and I were friends then. How very wonderful to hear from you! Yes, I am that Shannon! I am eager to hear what you have been up to, and will send you an email! I have been in awe of your work, for quite a while. You have such a unique color scheme that just excites me! I love it so! Great work…must have been a tough journey, as being somewhat of a rebel?? I wish to own one someday…..I just want to get some of your Christmas cards……God Bless you. Thank you for writing! I am thrilled to know you are enjoying my artwork. You are so right! Colour excites me too, I love the experience of intuitively laying on these colour combinations, and find the surprises that are revealed along the way to be so amazing. There is a beautiful colour experience that I would like to share with you… A couple of years ago I visited a Gallery in Las Vegas where they had EVERY Warhol Marilyn framed and displayed side by side… I’m sure you know… These prints are very large and such bright colours. I walked up to the first and spent time feeling the effect the colours had on me, then I moved to the next print… same image with different colours… and felt that one… one after the other… all the way to the last print. Truly amazing colour experience! I really like your idea of Christmas Cards. I will look into Christmas Cards and will make sure to have them on my Website so you can get cards for this coming Christmas, That is a GREAT idea, Thank you! Thank you again for your support and encouragement! I appreciate your message and I look forward to hearing from you again. And, please Let me know if you see a painting you wish to collect and I will help you connect with the Gallery who is showing it. I love your art Shannon!! Beautiful! I appreciate all your support and enthusiasm for my artwork! Can’t wait to visit with you again! Thank you for your note, I appreciate hearing from you. I am excited to know that you enjoyed seeing my artwork at Mountain Galleries in Whistler! Watch for more, I am just now getting a new collection of paintings ready to deliver. I hope you had a great time in Whistler! I appreciate you checking over my website, you are very kind! I am happy you enjoyed it, this new website is so much fun to create! I have seen your art work a lot.. and i just want to say how beautiful your work is…I was wondering if you could paint a picture of my horse for me if i sent you a picture.. I seen a picture of one of your horses , that i am interested in, are those the original paintings? Could you give me prices on your art work?